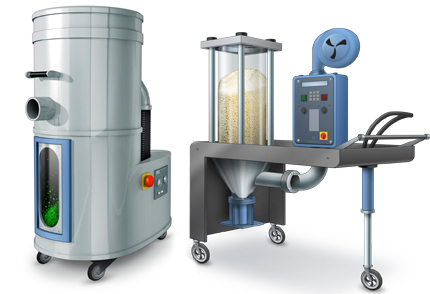 The drying and dust removal on the granules is a basic precondition for the manufacturing of superior plastic parts. Due to product abrasion, many plastic granules already contain dust and fibres (angel hair) when delivered. These cause a reduction in quality in the end product, especially in optical and high-gloss parts, or it can lead to plant downtime through product clogging. Pressure measurement from WIKA monitors the vacuum of the dust removal system (figure left). A particular challenge is to dry hygroscopic thermoplastics to the optimum residual humidity for processing. This is only possible using air processing with an extremely low dew point and thus a minimal absolute water content. Temperature measuring instruments from WIKA support the energy-efficient operation of the dryers (figure right). Our level measuring instruments monitor the filling height in the drying vessel, and pressure measuring instruments secure the air supply to the blower. As a plastics processor with over 30 of our own injection moulding machines, WIKA understands these challenges. The cooperation of our development and manufacturing has led to products which fulfil the measurement tasks of granulate preparation outstandingly.